A small party of four shot up to Kennedy Lodge on Friday 2 September for a crack at Mt Greenlaw (2315 m) from the Anti Crow river. We had heard rumours that Temple Basin had received 9 cm of snow in the previous two days, and with a brisk breeze forecast about the tops, it was difficult to know how the conditions would pan out. We made a reasonably early start on Saturday morning, leaving the bridge across the Waimakariri at 6 am for the pleasant walk up the Waimak and past the Anti Crow hut, making the confluence of the Anti Crow after a couple of hours. Hanging a left we started the dance with the river - left bank, cross, right bank, over the flats, rock step here, fallen tree there. Many of the chutes were full of avalanche debris from the past storm cycle, a number of which had swept over the river. It was now mid-morning but our fears of postholing the entire valley had been put to rest as the sun shone brightly through the still air. Making good time we stopped at around midday to change out of our light weight shoes and into our boots at 1200 m, nearing the head of the river. Now well above the snow line we took a rising line on the true right of the river to sidle above the waterfall and reach the delightful basin which would inevitably take us towards Gizeh col (1971 m) and our highpoint for day one. Because of the Anti Crow’s steep valley sides we hadn’t been completely sure of which col we were aiming for until we were within a kilometre or so of it. 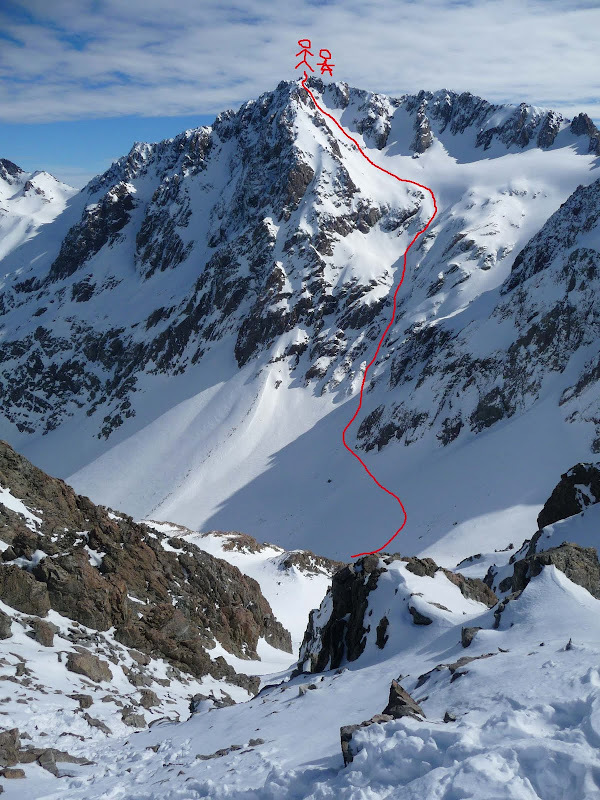 As we ascended the snow slopes to the col the most obvious line took us to climber’s right. By this stage we were getting pretty warm in the still air but were spurned on in the heat by the spindrift coming off the col. The obvious line took us to a very windy point about 10 m above the true col, providing our first view of the goal of the trip – Mt Greenlaw. The other side of the col consisted of a couloir descending to the flats at about 1750 m and our camp for the night. We got to our campsite at 4 pm so we had plenty of time to set up. Despite it being quite still, we were taking no chances and walled off our tents under a clear sky. The night passed quickly and uneventfully and we made another civilised start at 6:15, descending to the upper Avoca River before rising on steepening snow slopes to the Avoca Glacier. We had been playing guess the summit all morning, but now it was time to pick a slope and hope for the best. Fortunately the easiest looking slope also looked the most promising and we headed up. To this point we had been plugging up snowy faces, so it felt suddenly strange to climb to the top of the slope and be on a rather sharp ridgeline with significant exposure to the south. Unfortunately there was also a rather unhelpful rock step to negotiate. We had a good look at the rock quality for about 5 seconds before deciding we had to go back down a bit and find another way. 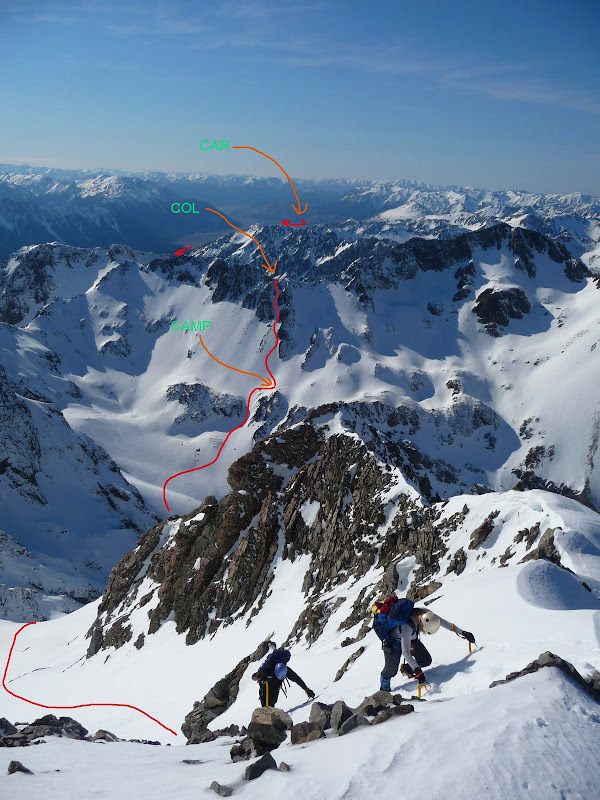 Fortunately there was an alternative, involving a sneaky 10 m traverse to climber’s right across a narrow, firm slope with a bit of exposure, then up a 20 m chute leading to the firm summit crest. With only a light breeze blowing and the sun shining we had been blessed with perfect conditions and a great view across the valley of Mt Murchison and back over to Mt Rolleston. But we still had a long way to go to get out and it was already 10 o’clock. Descending through softening snow we trudged back up to our camp and scoffed down lunch, before reascending to Gizeh col and back into the upper Anti Crow. The snow had softened considerably from the day before, but by taking a few slides in the upper basin and travelling on the true left below about 1100 m meant that postholing could be reduced. By the time we turned the corner into the Waimak valley our minds had drifted to warm cars and hot coffee. Unfortunately it seemed that while we had been away someone had moved the bridge about 10 km downriver, or so it seemed, meaning we slumped into the carpark shortly after 8 pm. A fantastic trip in very good conditions and perfect weather. We are still trying to work out where tramping ends and mountaineering begins. Most active Kiwis would call this trip a moderate weekend tramp. I will get a TR for this past weekend's burn up Manakau (2608 m from 130 m - ouch) in the Seaward Kaikouras soon. Very nice. We were up at the Bealey end of the Black Range a few days afterwards. Awesome TR. I would love to get into this kind of stuff. 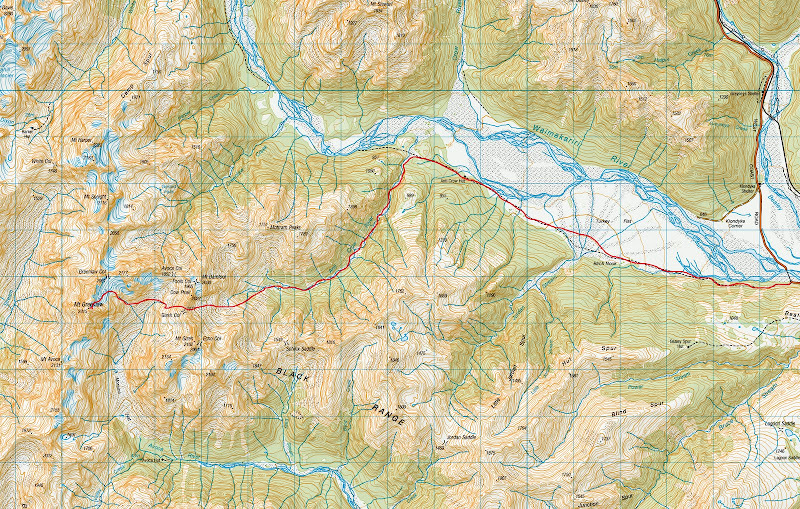 >We are still trying to work out where tramping ends and mountaineering begins. Most active Kiwis would call this trip a moderate weekend tramp. Yeah, but we all know that they don't sandbag over there do they, eh? In my ignorance, I would say if you need mountaineering smarts to avoid avalanche areas, crevasses etc, and utilise any mountaineering techniques for ascent/descent, then you are mountaineering, regardless of how much tramping between those events! A good read with great photos. Thanks for sharing the trip with us cruze. >m - ouch) in the Seaward Kaikouras soon. Be keen to see how you went with the crossings in Kaikoura...what footwear/clothing did you use to do all the fording in? >>m - ouch) in the Seaward Kaikouras soon. >did you use to do all the fording in? de rigeur is shorts and sneakers which is an excellent combination. I used it all through winter (sometimes with polypro) and it is the best combination between speed, safety and warmth I reckon. On the way into Manakau we crossed the Hapuku (main) a dozen or so times, then Hapuku (north) about the same number. On the way out the rivers had risen quite a bit with snowmelt which made the gorge section interesting (!) and we finished a 15 hour summit day after 9 pm which made the final river section a bit freaky in the dark. Anyway maybe I should put all that in the next TR. I will get some more TRs going for Rome Ridge (Mt Rolleston), Castle Hill Peak and the Gap, and Manakau. >begins. Most active Kiwis would call this trip a moderate weekend tramp. >Yeah, but we all know that they don't sandbag over there do they, eh? >A good read with great photos. >Thanks for sharing the trip with us cruze. The first weekend after moving over here I went on a NZAC overnight trip to Mt Alexander on the west coast. 1400m climb to camp on the first day and then up to the summit and back down the next. West coast vegetation and claggy misting rain on day one put me in a rather bad headspace. I tended to think I had pretty decent fitness in Aus but compared to the average active person over here I was nothing! Slowly I have been building up hill/pack fitness over here and now don't look at 100m contours the same way - more like how many 300m climb sections (about an hour) will there be. Still a ways to go. Over here they use words like "easy", "popular" and "interesting" to sandbag. It is not at all uncommon for trampers to take ice axes and crampons (and we aren't talking transalpine stuff) on day tramps. It is just a different scene to Aus bushwalking. One good thing is that there is pretty good water almost everywhere.